With the 2016 election now finished and Donald Trump confirmed as the president-elect of the United States, there are naturally some concerns about what this could means for the future of NASA. Given the administration’s commitment to Earth science, and its plans for crewed missions to near-Earth Orbit and Mars, there is understandably some worry that the budget environment might be changing soon. At this juncture, it is not quite clear how a Trump presidency will affect NASA’s mandate for space exploration and scientific research. But between statements made by the president-elect in the past, and his stances on issues like climate change, it seems clear that funding for certain types of research could be threatened. But there is also reason to believe that larger exploration programs might be unaffected. Back in September, the Senate Committee on Commerce, Science, and Transportation passed the NASA Transition Authorization Act of 2016. This bill granted $19.5 billion in funding for NASA for fiscal year 2017, thus ensuring that NASA’s proposed activities would not be affected by the transition in power. Central to this bill was the continued funding of operations that NASA considered to be central to its “Journey to Mars“. Beyond FY 2017, though, the picture is unclear. When it comes to things like NASA’s Earth Science program, the administration of a president that denies the existence of Climate Change is expected to mean budget cuts. For instance, back in May, Trump laid out his vision for an energy policy. Central to this was a focus on oil, natural gas and coal, the cancellation of the Paris Agreement, and the cessations of all payments to the UN Green Climate Fund. This could signal a possible reverse of policies initiated by the Obama administration, which increased funding for Earth science research by about 50 percent. And as NASA indicated in a report issued on Nov. 2nd by the Office of the Inspect General – titled “NASA’s Earth Science Mission Portfolio” – this has resulted in some very favorable developments. “We’ve seen a disproportionate increase in the amount of federal funds going to the earth sciences program at the expense of funding for exploration and space operations, planetary sciences, heliophysics, and astrophysics, which I believe are all rooted in exploration and should be central to NASA’s core mission. We need to get back to the hard sciences, to manned space exploration, and to the innovation that has been integral to NASA. From all of this, a general picture of what NASA’s budget environment will look like in the near future begins to emerge. In all likelihood, the Earth Science division (and other parts of NASA) are likely to find their budgets being scrutinized based on newly-developed criteria. Essentially, unless it benefits space exploration and research beyond Earth, it’s not likely to see continued funding. “In times when there has been much news about all the things that divide our nation, there has been noticeable bipartisan support for this work, our work – support that not only reaches across the aisle, but across the public, private, academic and non-profit sectors. For NASA’s sake, I hope Bolden’s words prove to be prophetic. For no matter who holds of the office of the President of the United States, the American people – and indeed, all the world’s people – depend upon the continued efforts of NASA. As the leader in space exploration, their presence is essential to humanity’s return to space! Barely two months after being launched to the International Space Station (ISS), NASA’s first science payload aimed at conducting Earth science from the station’s exterior has started its ocean wind monitoring operations two months ahead of schedule. Data from the ISS Rapid Scatterometer, or ISS-RapidScat, payload is now available to the world’s weather and marine forecasting agencies following the successful completion of check out and calibration activities by the mission team. Indeed it was already producing high quality, usable data following its power-on and activation at the station in late September and has monitored recent tropical cyclones in the Atlantic and Pacific Oceans prior to the end of the current hurricane season. RapidScat is designed to monitor ocean winds for climate research, weather predictions, and hurricane monitoring for a minimum mission duration of two years. “RapidScat is a short mission by NASA standards,” said RapidScat Project Scientist Ernesto Rodriguez of JPL. ISS-RapidScat instrument, shown in this artist’s rendering, was launched to the International Space Station aboard the SpaceX CRS-4 mission on Sept. 21, 2014, and attached at ESA’s Columbus module. It will measure ocean surface wind speed and direction and help improve weather forecasts, including hurricane monitoring. Credit: NASA/JPL-Caltech/Johnson Space Center. The 1280 pound (580kilogram) experimental instrument was developed by NASA’s Jet Propulsion Laboratory. It’s a cost-effective replacement to NASA’s former QuikScat satellite. The $26 million remote sensing instrument uses radar pulses reflected from the ocean’s surface at different angles to calculate the speed and direction of winds over the ocean for the improvement of weather and marine forecasting and hurricane monitoring. The RapidScat, payload was hauled up to the station as part of the science cargo launched aboard the commercial SpaceX Dragon CRS-4 cargo resupply mission that thundered to space on the company’s Falcon 9 rocket from Space Launch Complex-40 at Cape Canaveral Air Force Station in Florida on Sept. 21. ISS-RapidScat is NASA’s first research payload aimed at conducting near global Earth science from the station’s exterior and will be augmented with others in coming years. It was robotically assembled and attached to the exterior of the station’s Columbus module using the station’s robotic arm and DEXTRE manipulator over a two day period on Sept 29 and 30. Ground controllers at Johnson Space Center intricately maneuvered DEXTRE to pluck RapidScat and its nadir adapter from the unpressurized trunk section of the Dragon cargo ship and attached it to a vacant external mounting platform on the Columbus module holding mechanical and electrical connections. The nadir adapter orients the instrument to point its antennae at Earth. The couch sized instrument and adapter together measure about 49 x 46 x 83 inches (124 x 117 x 211 centimeters). “The initial quality of the RapidScat wind data and the timely availability of products so soon after launch are remarkable,” said Paul Chang, ocean vector winds science team lead at NOAA’s National Environmental Satellite, Data and Information Service (NESDIS)/Center for Satellite Applications and Research (STAR), Silver Spring, Maryland. This has been a banner year for NASA’s Earth science missions. At least five missions will be launched to space within a 12 month period, the most new Earth-observing mission launches in one year in more than a decade. ISS-RapidScat is the third of five NASA Earth science missions scheduled to launch over a year. NASA has already launched the of the Global Precipitation Measurement (GPM) Core Observatory, a joint mission with the Japan Aerospace Exploration Agency, in February and the Orbiting Carbon Observatory-2 (OCO-2) carbon observatory in July 2014. NASA inaugurated a new era of research for the International Space Station (ISS) as an Earth observation platform following the successful installation and activation of the ISS-RapidScat science instrument on the outposts exterior at Europe’s Columbus module. The ISS Rapid Scatterometer, or ISS-RapidScat, is NASA’s first research payload aimed at conducting near global Earth science from the station’s exterior and will be augmented with others in coming years. RapidScat is designed to monitor ocean winds for climate research, weather predictions, and hurricane monitoring. The 1280 pound (580 kilogram) experimental instrument is already collecting its first science data following its recent power-on and activation at the station. “Its antenna began spinning and it started transmitting and receiving its first winds data on Oct.1,” according to a NASA statement. The first image from RapidScat was released by NASA on Oct. 6, shown below, and depicts preliminary measurements of global ocean near-surface wind speeds and directions. The $26 million remote sensing instrument uses radar pulses to observe the speed and direction of winds over the ocean for the improvement of weather forecasting. “Most satellite missions require weeks or even months to produce data of the quality that we seem to be getting from the first few days of RapidScat,” said RapidScat Project Scientist Ernesto Rodriguez of NASA’s Jet Propulsion Laboratory, Pasadena, California, which built and manages the mission. “We have been very lucky that within the first days of operations we have already been able to observe a developing tropical cyclone. RapidScat, payload was hauled up to the station as part of the science cargo launched aboard the commercial SpaceX Dragon CRS-4 cargo resupply mission that thundered to space on the company’s Falcon 9 rocket from Space Launch Complex-40 at Cape Canaveral Air Force Station in Florida on Sept. 21. Dragon was successfully berthed at the Earth-facing port on the station’s Harmony module on Sept 23, as detailed here. The nadir adapter orients the instrument to point at Earth. Engineers are in the midst of a two week check out process that is proceeding normally so far. Another two weeks of calibration work will follow. Thereafter RapidScat will begin a mission expected to last at least two years, said Steve Volz, associate director for flight programs in the Earth Science Division, NASA Headquarters, Washington, at a prelaunch media briefing at the Kennedy Space Center. 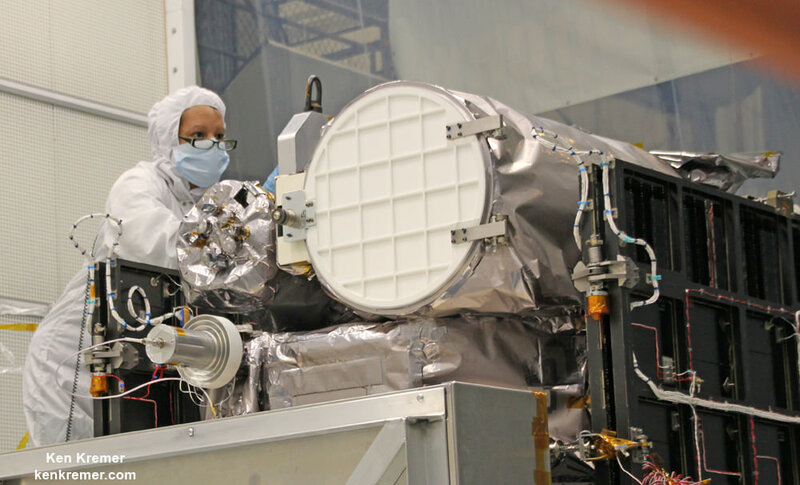 RapidScat is the forerunner of at least five more Earth science observing instruments that will be added to the station by the end of the decade, Volz explained. The second Earth science instrument, dubbed CATS, could be added by year’s end. The Cloud-Aerosol Transport System (CATS) is a laser instrument that will measure clouds and the location and distribution of pollution, dust, smoke, and other particulates in the atmosphere. CATS is slated to launch on the next SpaceX resupply mission, CRS-5, currently targeted to launch from Cape Canaveral, FL, on Dec. 9. NASA has already launched the Global Precipitation Measurement (GPM) Core Observatory, a joint mission with the Japan Aerospace Exploration Agency in February, and the Orbiting Carbon Observatory-2 (OCO-2) carbon observatory in July 2014.